While I’m not one to spiralize every ingredient that dances through my kitchen, I am definitely on board with the spiralizing movement as a whole. My favorite foods to spiralize are vegetables like carrots, beets, and daikon radishes. At the end of the day, building meals around these spiralized veggies helps to get more vegetables into my diet and that is never a bad thing. 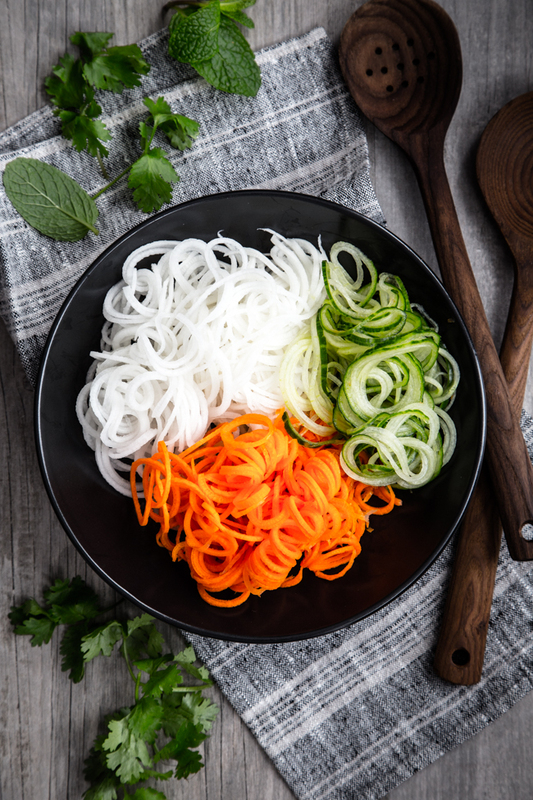 If you are looking to get started in veggie spiralizing, try taking your favorite noodle based recipe and swapping out the noodles for a sturdy spiralized veggie. My family eats a lot of noodle bowls and soups so this is where I began to swap out noodles for veggie spirals. 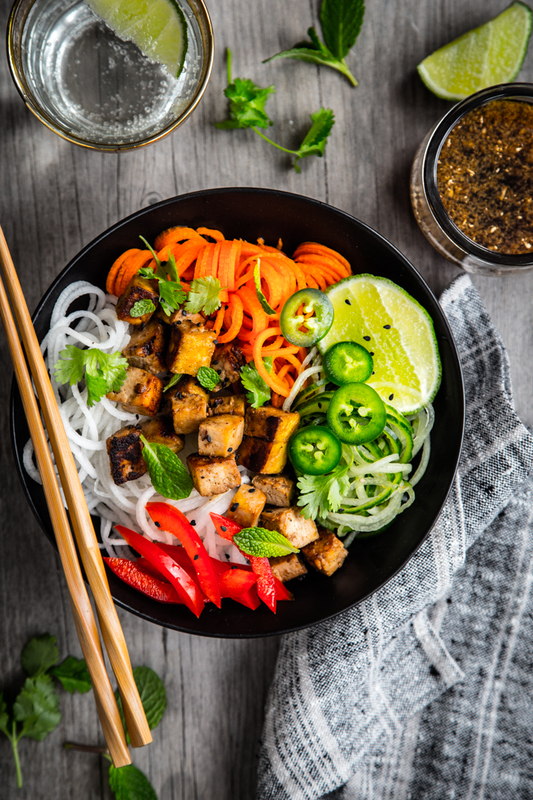 This Thai Style Spiralized Veggies with Tofu recipe is a play on a recipe that I’ve made numerous times. The base of this noodle bowl is made up of spiralized fresh daikon radish, carrots, and an English cucumber. These are vegetables that often appear in Thai dishes and they all work beautifully with a spiralizer. Daikon radishes are the large white radishes that are often found in Asian cuisine. They are more mild in flavor than red radishes, and they spiralize into noodle perfection. 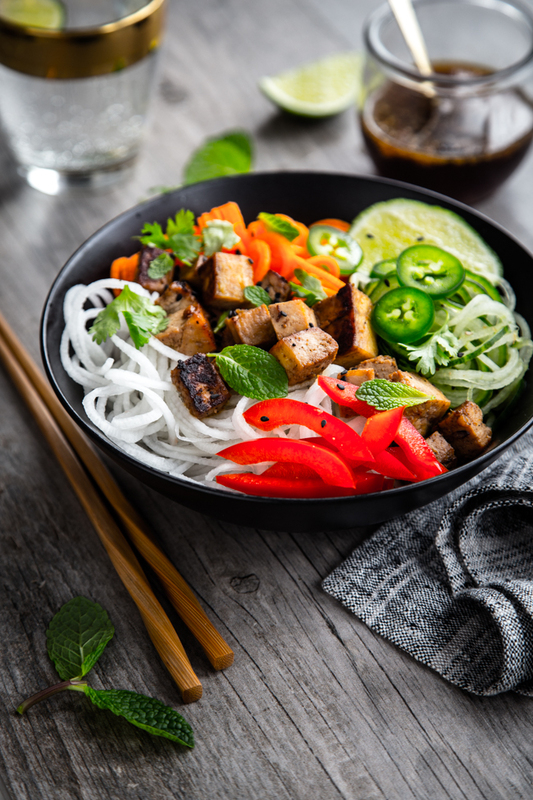 They are tender, yet strong making them a fantastic base to this noodle bowl. They bring a good amount of fiber and Vitamin B6 and C to the party, as well. The carrots add substance and crunch to this recipe along with a good amount of beta-carotene, fiber, and vitamin K. When spiralizing your cucumbers, its important to work with seedless or English cucumbers because they are sturdy enough to stand up to the spiralizing process while standard cucumbers have centers that are too soft to spiralize. I learned that the hard way and ended up with a bowl full of cucumber mush. Not appetizing. If you have a ribbon cutting attachment to your spiralizer, that is a great option for the cucumbers, too. One simple sauce for this recipe pulls double duty as a marinade for the tofu and dressing for the vegetables. Sprinkle each bowl with some thinly sliced red bell pepper, jalapeño pepper, and fresh cilantro and mint leaves. 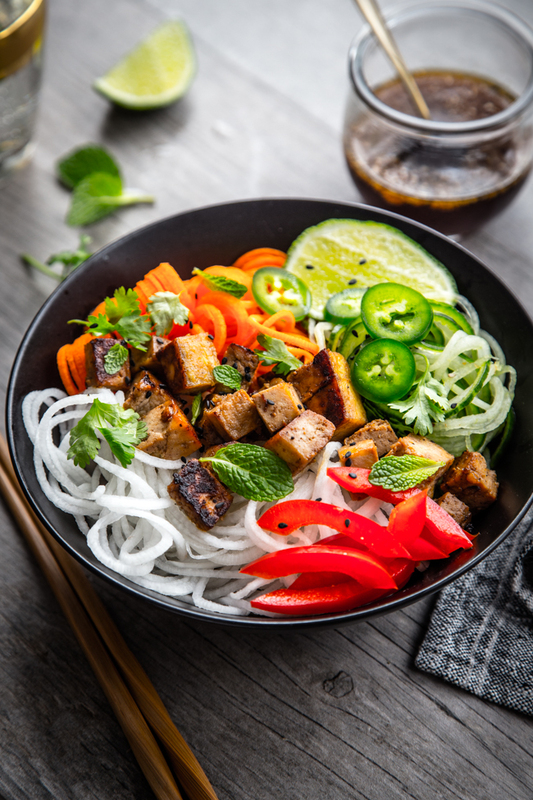 These Thai Style Spiralized Veggie bowls make a fresh and bright spring meal. Dice the tofu into small cubes and set aside. In a bowl or glass measuring cup, whisk together the rice vinegar, soy sauce, fish sauce, ginger, garlic, lime juice, and crushed red pepper. 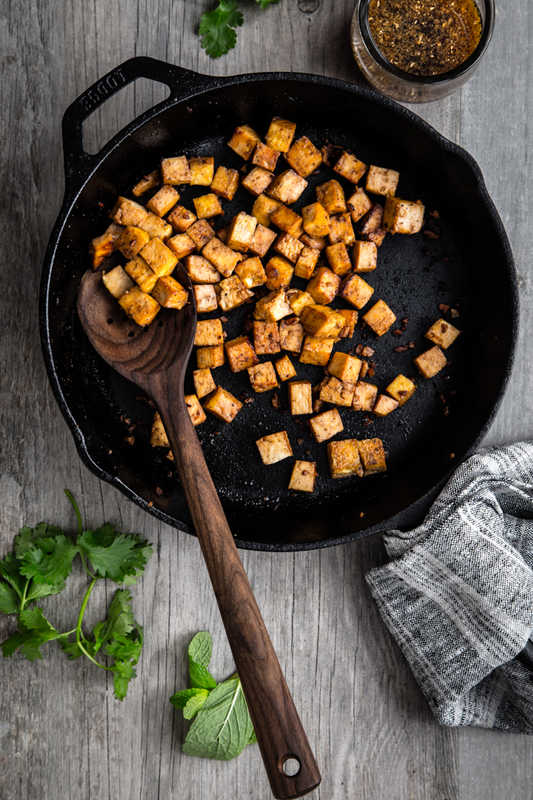 Heat the oil in a non-stick or well seasoned cast iron skillet over medium-high heat and add the tofu. Cook for about 5 minutes, stirring occasionally until the tofu begins to brown. Add about 1/4 cup of the vinegar sauce to the tofu and continue to cook until the sauce has caramelized and the tofu is crispy. Remove from heat and set aside. Spiralize the veggies and divide among 4 bowls. Top with crispy tofu and dress with reserved sauce. Garnish bowls with bell pepper, jalapeño, cilantro, and mint.